The system is powered by a 3.6 GHz Intel Core i3-8100 Quad-Core processor that will allow you to run multiple applications simultaneously. The 8GB of 2666 MHz DDR4 RAM helps to ensure smooth multitasking and also allows the computer to quickly access frequently used files and programs. While the current memory configuration is 1 x 8GB, there are four 288-pin DIMM memory slots that will allow the RAM to be upgraded to 64GB, using a 16GB chip in each of the four slots. For storage of your files, the 1TB 7200 rpm SATA 3.5" hard drive offers quick access to your data. For additional internal storage, there is an empty 2.5" SSD bay, a shared internal/external 3.5" bay, and two M.2 2280 slots for a PCIe SSD. 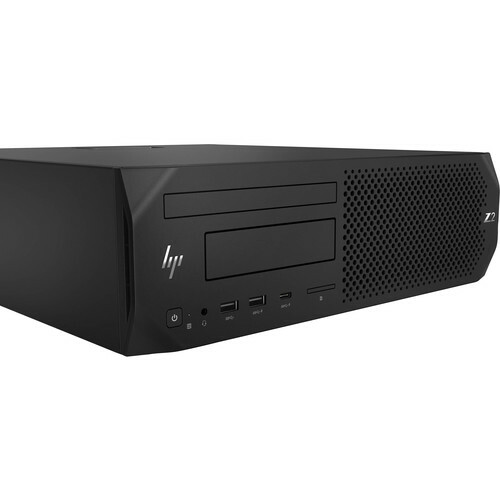 If you want to add external storage drives or other peripherals, the Z2 G4 features six 5 Gb/s USB 3.0 Type-A ports, one of which doubles as a charging port, plus two USB 2.0 Type-A ports. The integrated Intel UHD Graphics 630 chipset delivers a sharp, clear picture, and features two DisplayPort 1.2 outputs which support two displays and a maximum resolution of 4096 x 2160 @ 60 Hz. Whether you are listening to music, watching a movie, or playing a game, the integrated Conexant CX20632 5.1 audio codec outputs high definition audio and delivers higher fidelity than standard audio controllers.